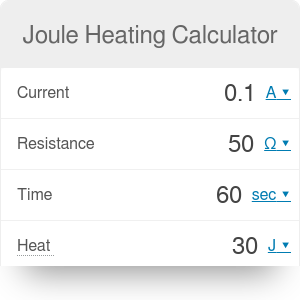 This Joule heating calculator lets you find the heat generated by current flowing through a resistor. Have you ever wondered why do you need to cool your computer? Do you know how conventional heaters work? Read the text below to find the answers and learn about the Joule heating formula. Electrical energy is carried by tiny charged particles - electrons, which flow through a cable creating an electrical current. You surely know that the entire matter around us is made up of atoms. Now you can imagine that if a moving electron collides with an atom, the electron will lose some of its energy. This energy is then converted into heat, and therefore the temperature of the cable is raising. We can say how much energy is lost in this way, knowing the voltage drop on the wire. You can learn even more about it - make sure to check out our voltage drop calculator. This equation can be used with every electrical network provided that the flowing current is direct (DC). In particular, you can compute the amount of heat generated by resistors in series or parallel resistors. Just calculate appropriate resistance R using our calculators. Joule heating is often an undesirable effect because the generated heat means lost energy. In electronic devices, the Joule phenomenon causes heat to escape inside the device and requires heat reduction to work correctly. That's why electronic devices such as computers need to be cooled. On the other hand, we can use Joule heating to raise the temperature on purpose. Currently, most conventional heaters, found for example in electrical kettles or washing machines, consist of a coiled cable with the current. There are also materials that don't have any resistance; thus, they don't lose any energy due to Joule heating. They are called superconductors, but their extraordinary properties only occur at very low temperatures. Joule Heating Calculator can be embedded on your website to enrich the content you wrote and make it easier for your visitors to understand your message.